Many of today's most important cancer treatment innovations were first developed here at Stanford. Stanford Cancer Center South Bay furthers this tradition of innovation. 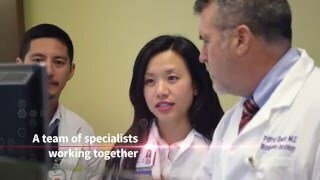 Working together with researchers and scientists at the Stanford Cancer Institute, our doctors advance the treatment of cancer every day, including in radiation therapy and targeted therapies. We believe in collaboration and teamwork. Committed to partnership and patient-centered care, our treatment teams focus on identifying the optimal plan of care to deliver the best odds for every patient. The list of treatments we offer continues to evolve as effective new techniques and technologies are developed. To learn whether we offer a type of treatment you do not see listed here, please call 408-426-4900.